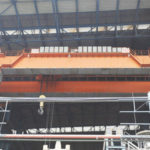 Double girder EOT crane comes into play at various workplaces where moving bulky and heavy loads is demanded. 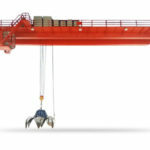 It typically comes in top running design that enables the crane users to lift and move loads through the overhead space of the facility easily and quickly. 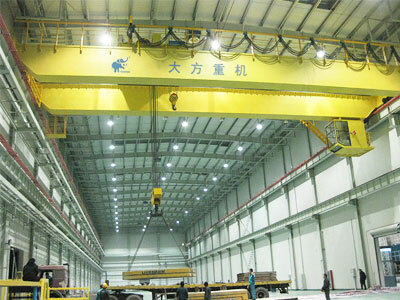 The EOT crane, as known as electric overhead travelling crane, has greater lifting capabilities than single girder EOT crane. The rated load weight is in a range of 3 ton to 320 ton so as to serve a variety of lifting needs. The overhead EOT crane can also be tailored for your special lifting requirements. 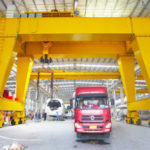 By utilizing a double girder crane, you can maximize working efficiency and productivity as the overhead crane is able to lift and transport heavy loads within your facility quickly and easily. The crane overhead provides excellent safety for lifting operations since it is installed in the overhead space of the facility. Also, it can lift and move goods safely through obstacles so as to avoid any damage to the product. The heavy duty EOT crane will free the floor space and avoid obstructions on your facility floor. It has precision positioning so that it enables the operators to place loads virtually anywhere they desire. The overhead lifting equipment has long working life that it will bring about the maximum cost effectiveness for your business. 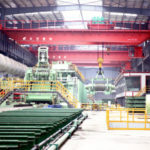 Manufacturing plant: to move unfinished products throughout production process. Machine shop: to lift and move heavy machines and their parts in the workshop. Steel warehouse: to move heavy goods within the storage areas. Foundry: to transport hot molten metal in the plant. 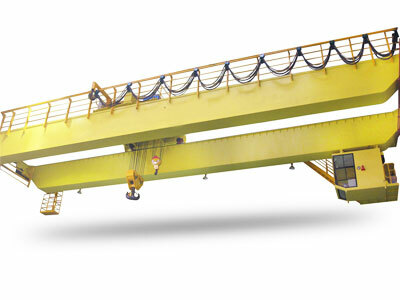 When it comes to continuous and heavy duty lifting work, a double girder top running crane will be the best solution. 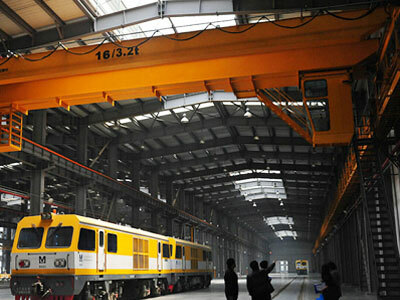 The double girder overhead travelling crane can be custom designed and built for your requirements. 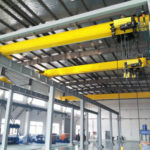 In terms of materials to be handled, the overhead traveling crane can be fitted with hook, grab bucket, electromagnetic chuck, spreader and so on to deal with different types of materials. It can also be easily customized by adding one accessory below the hook, such as carrier beam, spreader beam, tong and sheet lifter. Other double girder EOT crane parts and components can be customized or taken special treatments so as to serve your individual lifting applications, such as foundry, scrap yard, chemical plant and fertilizer plant. The working mechanism of double girder EOT crane consists of three main parts that fulfill your heavy lifting requirements: hoisting mechanism, trolley travelling mechanism and crane travelling mechanism. Incorporating the uses of these mechanisms, the industrial EOT crane will be able to lift and move loads in three dimensions. The hoisting mechanism is the unit for lifting large objects vertically. It is usually mounted to a trolley. To meet your heavy duty lifting application, the electric hoist is more often employed. 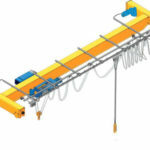 Trolley travelling mechanism runs horizontally along two bridge girders so that the goods can be moved in a direction that is vertical to the crane runway. Crane travelling mechanism is the unit driving the entire crane to move horizontally along runway beam. 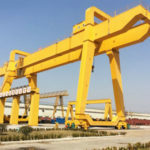 Dafang group is a reputable double girder EOT crane manufacturer as well as a service provider since we provide a full spectrum of service encompassing EOT crane design, fabrication, delivery, installation and maintenance. To get an affordable double girder EOT crane price, contact the sales team now.